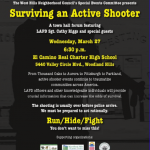 We are just six days away from what may be the most important forum you will attend this year: “Surviving an Active Shooter Event” at El Camino Charter High School on Wednesday, March 27. This FREE and very important interactive town hall is arranged by the West Hills Neighborhood Council’s Special Events Committee and is supported by other Neighborhood Councils and Chambers of Commerce. It begins at 7:00 p.m., with doors opening at 6:30 p.m.
FREE food and refreshments, supplied by many of our West Hills merchants who recognize the importance of this event, will be available before and after the town hall. This subject is especially timely in the aftermath of shootings at the Borderline Bar & Grill in Thousand Oaks, the Tree of Life Synagogue in Pennsylvania, the music festival in Las Vegas and the most recent horror in New Zealand. It has become evident that residents must know how to increase their odds of survival should they find themselves in such an occurrence, since the shooting is usually over before police arrive. The information you will learn at this interactive forum might help you survive. 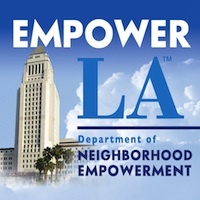 Our town hall forum, with the theme “RUN/HIDE/FIGHT,” was created by the Los Angeles Police Department and developed with assistance of the U.S. Department of Homeland Security. It will be presented by one of the best, LAPD’s Topanga Station’s Sgt. Cathy Riggs. Sgt. Riggs is responsible for providing local and state-mandated training for approximately 230 sworn and 20 civilian police employees and overseeing use-of-force, pursuit and other administrative investigations. She is a Terrorism Liaison Officer and certified as a Department and Police Officer Standards and Training (POST) instructor in several subjects. Sgt. Riggs is an expert in active shooter prevention and response and is working on her master’s degree in forensic psychology, specializing in threat and risk assessment. She is a member of the Association of Threat Assessment Professionals (ATAP), the International Association of Chiefs of Police and the American Psychological Association. In this town hall, she will prepare you to act rationally in an active shooter event so you will know what to do without panic. As it stands now, we expect to have survivors of an active shooter attending to share their stories. This event is supported by the Canoga Park/West Hills Chamber of Commerce, the Woodland Hills-Warner Center Neighborhood Council, the Canoga Park Neighborhood Council and the West Valley-Warner Center Chamber of Commerce. Put it on your calendar and be sure to attend. Parking is easy on the campus and close to the event. See you there. If there is only one town hall you will attend this year, THIS IS IT!